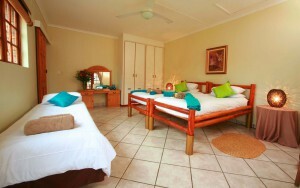 Family room suite consists of 2 separate bedrooms sharing a full bathroom with a bath and shower. The toilet is separate. One bedroom is equipped with a double bed, built in cupboards, ceiling fan and outside patio door. 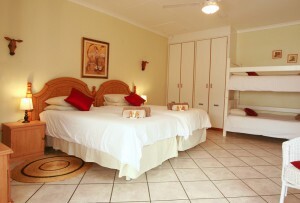 The 2nd bedroom is equipped with 2 single beds, built in cupboards and ceiling fan. Both rooms lead out on to the patio and garden with a view of the sparkling pool. Complimentary coffee and tea tray in the rooms. Room 3 consists of a spacious bedroom with queen size bed. En suite bathroom with a shower only. This room has its own outside entrance and leads onto the patio and garden. The room has built in cupboards and a ceiling fan. Complimentary coffee and tea tray in the room. Room 4 consists of a spacious bedroom with a King size bed or twin beds and a bunk bed. The bathroom is en suite with a shower only. 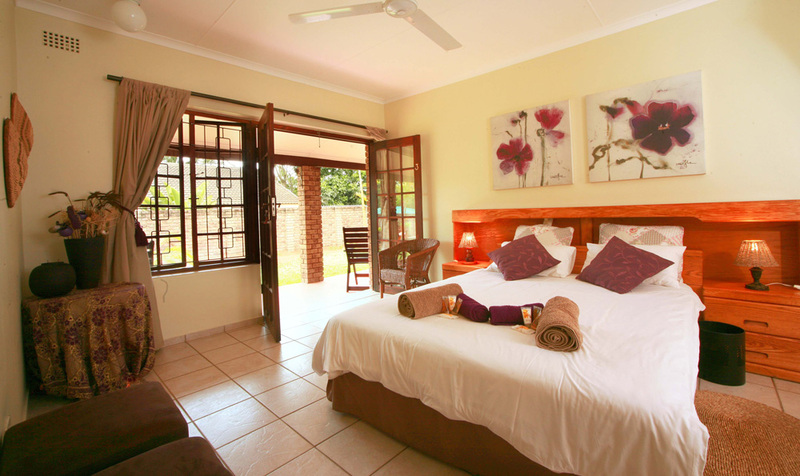 The bedroom has its own outside entrance and leads onto the patio and garden. 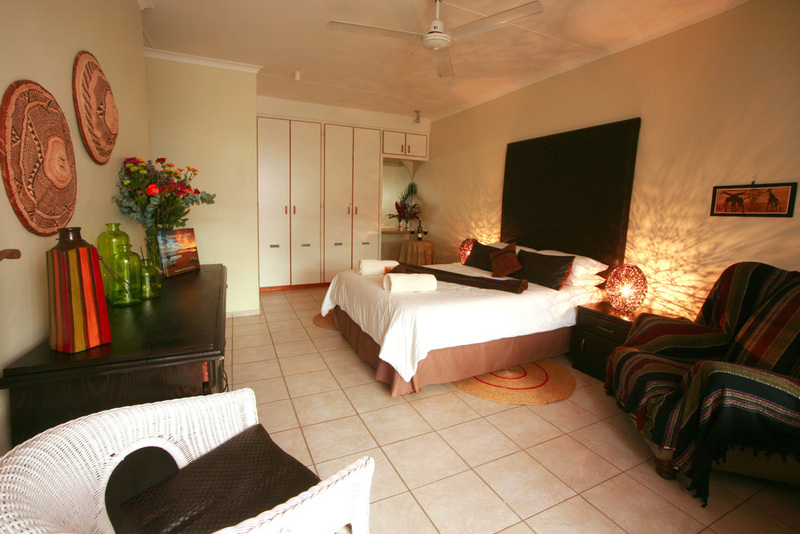 The room has built in cupboards with a ceiling fan and fitted with aircon. Complimentary coffee and tea tray in the room. Room 5 consists of a spacious bedroom with A King size bed or twin beds and a bunk bed. The bathroom is en suite with a shower only. 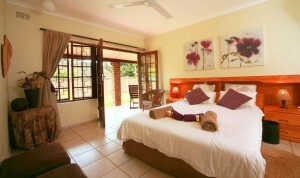 The bedroom has its own outside entrance and leads onto the garden. This bedroom is a little more private. The room has built in cupboards with a ceiling fan and fitted with aircon. Complimentary coffee and tea tray in the room. Room 6 consists of a spacious bedroom with queen size bed. En suite bathroom with a shower only. This room has its own outside entrance and leads onto the garden. This room is a little more private The room has built in cupboards and a ceiling fan. Complimentary coffee and tea tray in the room.